Have you ever considered growing your own sprouts? No green thumb is required – there are just 3 easy steps for growing sprouts. If you start today, your very own sprouts will be ready in just 5 days. Are you ready? Let’s begin! a mason jar, washed, sterilized (place in 225 ° F oven for at least 10 minutes), and cooled down to room temperature. I’ve often been asked why the jars need to be sterilized. Well, it’s the same reason your seeds need to be organic: we want to grow sprouts which are chemical and pathogen-free. I usually buy my seeds at a natural food store (Marché Tau). They are also easily available for purchase online. Sprouts are truly the jackpot of nutrition. They provide you with vitamins, minerals and anti-oxidants. And it really is so, so easy to incorporate this low calorie food in your diet. They are a great addition in sandwiches, wraps, salads, smoothies and even soups. Did you know that almost all seeds and beans can be sprouted? And they each provide a different flavour to go with their crunchiness. Alfalfa sprouts are the most popular, but other options include lentils, red clover, fenugreek, and mung beans. Isn’t it great to have choices! Go ahead and experiment. Once you have measured your beans or seeds, rinse them. Make sure there are no impurities. Then, place them in your jar and fill them with fresh tap water. Cover the jar with the cheesecloth and secure it with the mason ring or an elastic. Swirl your jar around a couple of times and then pour out the water. We need to rinse them a couple more times, so repeat this procedure. Then, fill your jar halfway with water and let it stand overnight. The seeds are dormant when they are dry, but the minute they are wet, they start to germinate. For example, alfalfa seeds need to soak for approximately 8 hours. 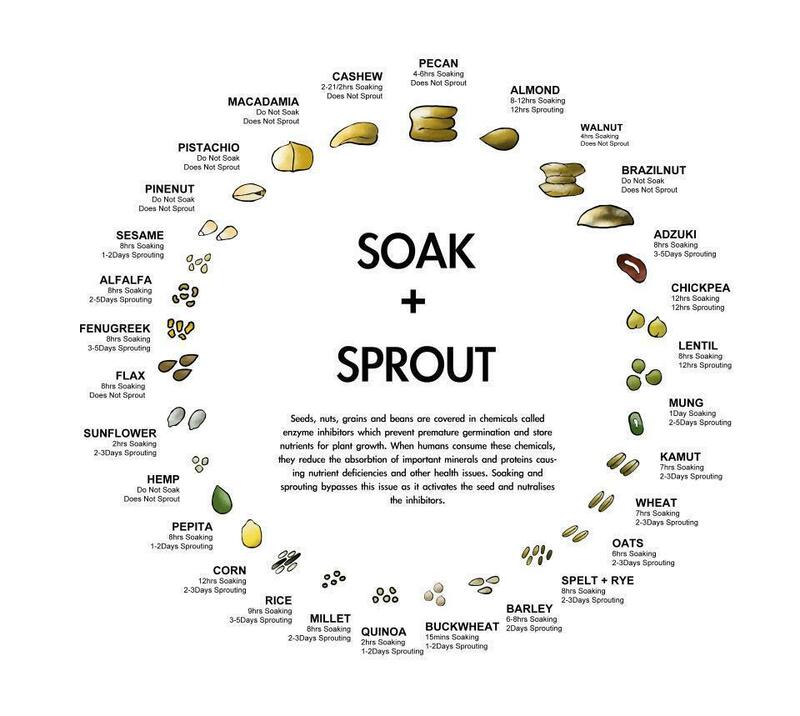 Different seeds and beans need to soak for different amount of times. If you’re wondering where to place the jar, as long as it receives no direct sunshine, it really doesn’t matter. I usually place my jars on my counter top (in my kitchen) away from the sunshine, close to the sink. When you check your sprouts the next morning, you will notice nothing has happened. I can still remember the disappointment the first time I grew my own sprouts. I think I read Jack and the Beanstalk one too many times. (Which reminds me, this is really a great project to make with kids. Just get ready for the disappointed looks when they don’t see anything happening after one night of soaking.) Okay, so nothing has happened on the outside, but on the inside, there are all kinds of processes going on. We are awakening a sleeping giant…as soon as it starts to germinate, it becomes a live plant increasing the bio availability of all the nutrients. And remember, when eaten raw, they still have all of their enzymes, which can contribute to a healthy digestion. Okay, back to our jar. Every day, for five days, you will need to drain the water. Just pour it out – that’s why we have the cheesecloth. Fill it again with water – just a few inches – swirl and drain. Repeat a few more times. Once you have finished draining, place your jar upside down at a 45 degree angle. This will ensure that there is no water left in the jar. Do this at least twice a day (morning and evening). The seeds need proper drainage and circulation.This simple procedure prevents mold from growing and provides just the right amount of moisture. In just a few days, you will be able to enjoy wonderful, refreshing sprouts. Two tablespoons of alfalfa seeds produces about two cups of sprouts. I prefer my sprouts to be exactly that, sprouts. If you like, you can place the sprouts in indirect sunlight for a few hours, and the little green leaves you see in the picture will grow bigger. Once you obtain the growth desired, the sprouts should be refrigerated (3-4 days max) until ready to be consumed. Mine usually don’t last that long. And with that you have your 3 easy steps for growing sprouts. I’ve been growing sprouts since 2011. That’s when there was that food poisoning outbreak in Europe, which unfortunately was traced back to an organic farm growing sprouts. Sprouts are easily contaminated so make sure you take all the necessary precautions. I found a great chart on soak and sprout times. As you can see, you can sprout almost any seed or bean. Just 3 easy steps for growing sprouts. Simple, convenient and healthy. What more can you ask for? I’ve always been intimidated by the thought of growing my own sprouts. Your steps look pretty easy! I should probably give it a try 🙂 Thanks for the tutorial. I have sprouted lentils one time and it went amazing. Took them to work and made my friends try them. Best of luck, Hisham! I am sure they will be wonderful. Let me know how they turn out for you. Thanks for the comment. Lovely crunchy sprouts, I need to get on the sprout train they are such a great addition. Thanks for the inspiration. Lol! Happy to hear about your success!Thanks for your comment and support in my food blogging journey.